In this article, we'll learn some algorithms based on the simple tools of computational geometry. What is a sweep line? A sweep line is an imaginary vertical line which is swept across the plane rightwards. That's why, the algorithms based on this concept are sometimes also called plane sweep algorithms. We sweep the line based on some events, in order to discretize the sweep. The events are based on the problem we are considering , we'll see them in the algorithms discussed below. Other than events, we maintain a data structure which stores the events generally sorted by y coordinates (the criteria for ordering of data structure may vary sometimes) which is helpful in the processing when we encounter some event. At any instance, the data structure stores only the active events. One other thing to note is that the efficiency of this technique depends on the data structures we use. Generally , we can use set in C++ but sometimes we require some extra information to be stored, so we go for balanced binary tree. So, we need a better algorithm for this . Here, we'll discuss it using line sweep technique. For this problem, we can consider the points in the array as our events. And in a set, we store the already visited points sorted by y coordinate. So, first we sort the points in x direction as we want our line to move towards right. Now, suppose we have processed the points from 1 to N-1, and let h be the shortest distance we have got so far. 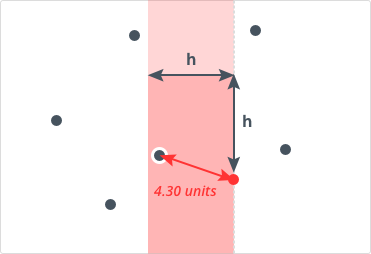 For Nth point, we want to find points whose distance from Nth point is less than or equal to h.
Now, we know we can only go till h distance from $$x_N$$ to find such point, and in the y direction we can go in h distance upwards and h distance downwards. So, all such points whose x coordinate lie in [$$x_N-h,x_N$$] and y coordinates lie in [$$y_N-h , y_N+h$$] are what we are concerned with and these form the active events of the set . All points in the set with x coordinates less than $$x_N-h$$ are to be deleted . After this processing, we'll add the Nth point to the set. One thing to note is that at any instance, the number of points which are active events is O(1)(there can be atmost 5 points around a point which are active excluding the point itself). 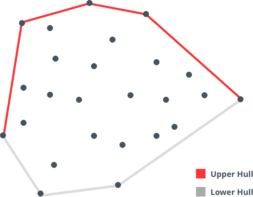 The red region in the image is the region containing points which are to be evaluated with the current point.The points left to this region are removed from the set. 1. First ,we have sorted the array of points on x coordinates. 2. Then we inserted the first point in the pnts array to the set box. Note we have defined py as the first in the pair, so set will be sorted by y coordinates. 4. In the second for loop , we are iterating over all points whose x coordinates lie in [$$x_N-h,x_N$$] and y coordinates lie in [$$y_N-h , y_N+h$$]. Finding the lower_bound takes $$O(log N)$$ and this loop runs for atmost 5 times. 5. For each point, insert into the set. This step takes $$O(log N)$$. Now, let's move on to our next problem. Problem: Given a set of $$N$$ axis aligned rectangles(edges of rectangles parallel to x axis or y axis), find the area of union of all of the rectangles. A rectangle is represented by two points , one lower-left point and one upper-right point. We start our algorithm by sorting the events by x coordinates. 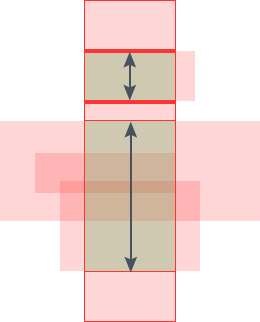 When a lower left point of a rectangle is hit (i.e., we encounter left edge of rectangle), we insert the rectangle into the set . 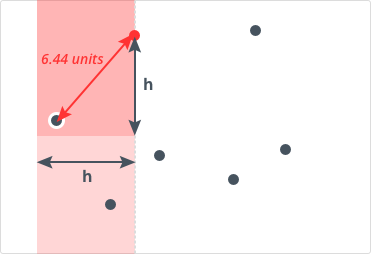 When we hit an upper right point of a rectangle (we encounter right edge of rectangle), we remove the rectangle from the set. At any instance, the set contains only the rectangles which intersect the sweep line (rectangles whose left edges are visited but right edges are not). The area swept at any instance is = $$\Delta$$y * $$\Delta$$x where $$\Delta$$y is the length of the sweep line which is actually cut by the rectangle(s) (sum of the vertical lengths of the orange region, in the figure below) and $$\Delta$$x is the distance between two events of this sweep line. But here we just know which are the rectangles intersecting the sweep line. So, here we have a new problem: how to find the length of the sweep line cut by the rectangles? The solution to this problem is pretty the same we have been doing by now. We use the line sweep technique to find this but this time we apply it 90 degrees rotated, i.e., we sweep a horizontal line from bottom to up . The events for this sweep line would be the horizontal edges of the active rectangles(rectangles cut by vertical sweep line). 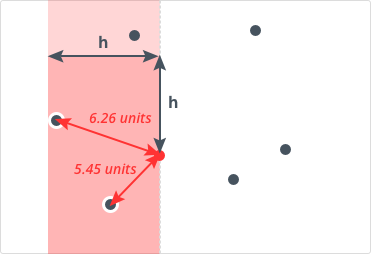 When we encounter a bottom horizontal edge of an active rectangle, we increment the counter (counter here maintains the number of rectangles that overlap at current time) and we decrement it on top horizontal edge of active rectangle. When the counter becomes zero from some non zero value, we have found cut length of the vertical sweep line, so we add the area to our final answer. The images above show how we're doing the horizontal sweep bottom up. $$\Delta$$y is the sum of the length of the two arrows shown in the last image. This we do, for all events of vertical sweep line. This was our algorithm. So, let's come to implementation part. For every event of vertical sweep line , we need to find the length of the cut on the sweep line, that means we need to go for horizontal sweep line. Here, we may use boolean array as our data structure because we would have once sorted the rectangles in order of vertical edges(vertical sweep) and once in order of horizontal edges(horizontal sweep), so we would have the sorting in both the directions. The complexity of the algorithm can be easily seen to be $$O(N^2)$$. The complexity can be reduced by some other data structures such as BST instead of boolean array. By now, you would have understood somewhat how to use this technique, right? Let's jump to one more problem that can be solved using this technique. Let S be a set of points. 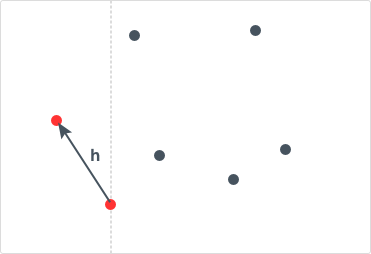 Then, convex hull is the smallest convex polygon which covers all the points of S.
There exists an efficient algorithm for convex hull (Graham Scan) but here we discuss the same idea except for we sort on the basis of x coordinates instead of angle. Sort the points of P by x-coordinate (in case of a tie, sort by y-coordinate). Initialize U and L as empty lists. The lists will hold the vertices of upper and lower hulls respectively. Remove the last point of each list (it's the same as the first point of the other list). Concatenate L and U to obtain the convex hull of P.
Points in the result will be listed in counter-clockwise order. That was our convex hull using Andrew's algorithm, here we sorted using x coordinates for sweeping our line rightwards. This was using our line sweep technique. Complexity of this algorithm is $$O(N* log N)$$ because of sorting. It may seem to be $$O(N^2)$$ because of while loop inside but this loop runs for overall $$O(N)$$ as we are deleting points in this loop and we have only N points , so it gives $$O(N)$$. Now you have got some taste of this technique, now try solving the attached problem. Do explore this technique's application in some other problems.